This building, Yazoo’s Main Street School from the time it was built in early 1904, was purchased in 1977 by the Yazoo Library Association through the civic and monetary efforts of citizens and businesses of Yazoo. It now belongs to the city of Yazoo City. The Main Street front is notable for its monumental portico of gigantic modified Ionic columns. The Sam Olden Yazoo Historical Society Museum, the William Duke Carter Collection of Antique Tools, the Yazoo City School of Dance, various art and music classes and events held throughout the year, the building’s theater, and its history make it an educational and cultural center for local citizens and for tourists. 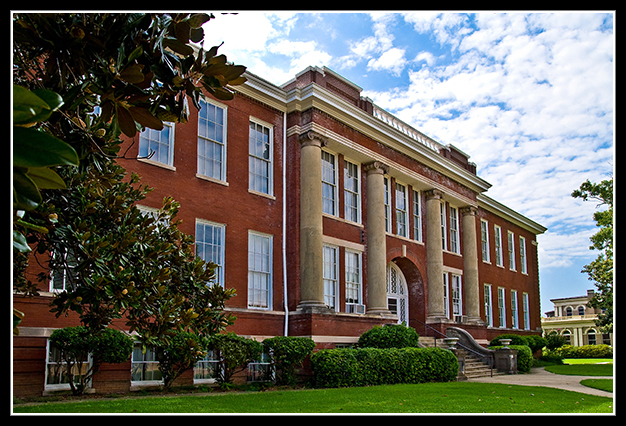 It is considered by the Mississippi Department of Archives and History to be one of the finest examples of a turn of the twentieth-century school in the state. The Triangle Cultural Center is open on weekday mornings and other times by appointment. For more information or to schedule your visit call 662-746-2273 or 601-966-6623.
sure miss being there. we wish all of you a very merry christmas and a blessed new year. see you in february. I’m writing a book about your county. Do you have a phone number where I could reach a local historian? Please reply by email or phone 9018261474.
Who is the new director of the Triangle Cultural Center? The current director of the Triangle Cultural Center is Ms. Lois Russell. Thank you. Does the Triangle Cultural Center have a new address? I tried to mail something at the post office box address, but it was returned to me. I learned the center moved. What’s the new address? I am sorry that happened. Not sure what the issue could have been. The Triangle Cultural Center has not moved – at least not since the building was built in 1904 (hehehe). The address is still 332 North Main Street. But what about the post office box address? I don’t know that they have one. The Triangle is located directly across the street from the Post Office, so I don’t think they have a PO Box. Ancestors on my maternal and paternal families were from Yazoo, MS. I am in the process of working on my Family Tree and would like to know where I would find historical documents on the the owners of plantations and slave schedules? Hi, Katrina. Thanks so much for asking. The Ricks Memorial Library is a great resource for family research. There is even a research librarian who volunteers there one day a week. You can call them at 662-746-5557.